Johann Georg Riedesel was born November 13, 1810 in Wunderthausen as the youngest of four known children of Johann Franz and Anna Margarethe (Fuchs) Riedesel. His father was the tenant in the house known as Seimes. Family tradition has it that he married Anna Catherine Riedesel of Wunderthausen in 1837 and that they soon left for America. This marriage is not recorded in the local parish records but it is possible that they were married elsewhere. As did other emigrants from Wunderthausen, the couple settled near Oxford, New Jersey where they eventually had eight children that we know of. And like some other Riedesels in this area (only), they began to go by “Riddle” (or Radle, or . . .). George–as he was known–died at Oxford on May 31, 1894 I think. Other records say 1884 and 1893. 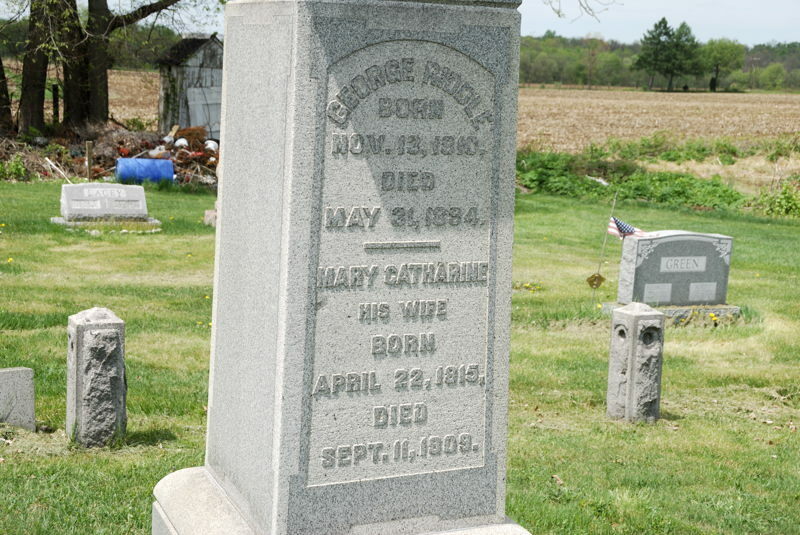 Catherine lived until September 11, 1909. They are buried in the small cemetery at Hazen. Naturalization papers. The clerk wrote his name something like “Reidel” but George’s signature looks to me like “Riedesl” with a so-called “long S”. He applied for citizenship in 1840 and was granted this status in 1842 after he had resided in the U.S. for five years as the law required.